Visionaries members share a diverse range of metaphysical interests. 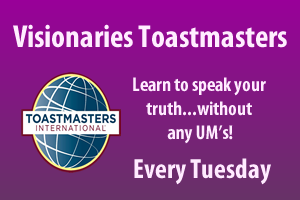 Although we utilize the same structure as other Toastmasters groups, our weekly themes focus on metaphysical topics. Our club is made up of 10 to 20 people who meet once a week for 90 minutes. Each meeting gives members an opportunity to practice conducting meetings, giving impromptu speeches, presenting prepared speeches and offering constructive evaluations. We have learned that it is not only what you say, but how you say it that often determines whether or not your message is heard. The self-paced program makes room for anyone looking to improve their speaking skills. Fear of public speaking is quite common, and this program provides a safe place to succeed. How do I Join Visionaries Toastmasters? Fill out some simple paperwork and bring your checkbook. Cost is $48.00 semi-annually plus a one time new member fee of $21.55. It is pro-rated monthly. Stop by any meeting and sample our warm & enthusiastic energy. We would love to have you join us! For more information or directions, contact our club president, Rachel Lugn, at rachelnaomilugn@gmail.com.